Kansas is the newest state to grow cotton. Corn and wheat grower, Tom Lahey, visited cotton fields in Hereford, Texas, and decided to give cotton a try in Moscow, Kansas. 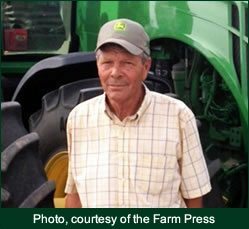 Tom planted his first cotton in 2000, and now farms a mix of dryland cotton, and pivot irrigated corn, cotton and wheat on 15,000 acres with his son. With only 17 inches of rainfall, in a good year, and lots of acres to manage, their time and water are the critical limits for success. Tom has developed an innovative water “sharing” system that allows corn and cotton to succeed even in dry years. 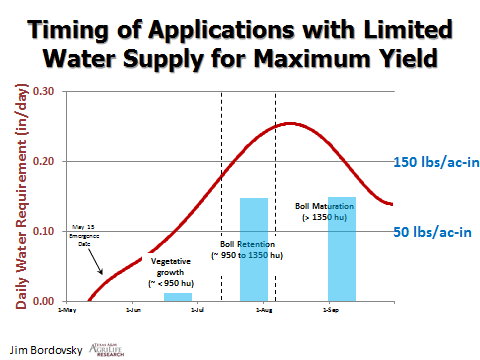 Corn’s heavy water use occurs early in the summer, while cotton’s slow vegetative growth delays its water use until after corn’s water needs are met. Where several pivots are fed from a common water source, the Lahey’s utilize this complementary water requirement by planting corn and cotton on connected pivots and gradually switching their water from corn to cotton during the growing season. Jim Bordovsky, with Texas A&M in Lubbock, has just completed a 4 year study showing that cotton is much more responsive to water during the boll retention and maturation periods. If seasonal water is limited it is best to apply it later in the season as each acre inch of water returns approximately 100 lbs of fiber. While an acre-inch of water applied prebloom only returns 10 lbs of fiber. Tom’s water “sharing” system goes even further in a dry year. He knows that corn yields can plummet under severe drought, while cotton is much more adaptable to limited moisture, especially prior to bloom. Since Kansas has a fixed annual water allotment, but the annual rainfall is highly variable, he can grow a healthy corn crop in low rainfall years (using the irrigation water) and still grow some cotton on rainwater. Rotating broad leaf crops with grains suppresses the soil diseases and nematodes that cannot feed on both. For example, verticillium wilt of cotton is suppressed with grain rotation. Grain stubble protects the cotton, the soil and the surface moisture from blowing away. The Lahey’s preserve their crop residue with strip till that keeps the diesel use and soil disturbances to a minimum. With one pass of the strip till, fertilizer is injected (if needed), residue is cut with coulters, and the seed bed is prepared with a rolling basket. Cotton’s deep tap root scavenges the residual moisture and nitrogen left in the subsoil by shallow corn roots. To capture this rotational benefit, each field is soil tested since some cotton fields require zero fertilizer nitrogen. Cotton’s drought tolerance provides a financial buffer to his corn and wheat. In extremely low rainfall years, cotton suffers less than grain crops. The Lahey’s further enhance cotton’s drought tolerance by planting fewer seeds (38,000 per acre) when water is limited and more seeds (55,000) when water is favorable. Fewer, well-spaced plants have a higher potential soil water reservoir for each plant. But the trade-off from lower plant populations is slightly lower yield potential if rainfall is ample in this northern, short growing season. An equally important financial benefit of the rotation is that the markets for cotton and grain generally don’t track each other so planting both helps to even out the dips in the commodity markets. Even though Tom is a grain farmer at heart, he enjoys the challenge of producing cotton and believes that cotton can contribute even more to the financial success of South Kansas.